As one of the festival directors for the immensely successful Jaipur literature festival, Mr. William Dalrymple was generous enough to spare a few minutes to DUB out of his extensively rigorous schedule, where he would not have been unjustified in shrugging us off. He talks about his never-ending romance as a travel writer in India and about the festival itself. Q: Sir, how do you feel about living in India? A: Well there is no answer to that since India has always been home. A lot of my friends are here. But yes, I do go back to Scotland for two months, usually in the summer to visit my family there. A. Well, Delhi is where home is. In spite of all its drawbacks, which we all are well aware of, it is still a wonderful city. I feel it has evolved greatly during the past twenty years. Rajpath, Old Delhi, C.P. and Safdarjung are some of my favorite places in the city. Other than Delhi, which is definitely home, I think Kochin is an amazing city, though a few years back I think I would have said Lucknow. I visit Kochin if I want to take a holiday from Delhi. Q. Do you plan to travel to the parts of India that you visited so far, for example the North East which is yet to feature in your books? A. North east is one of the regions in India I have yet to travel to but that trip is due sometime in February I figure. Another city that I am eager to visit is Varanasi. Q. You are known to be a disciplined writer yourself. How do you inculcate this habit? Well, to be disciplined in one’s writing, organization is important. Specially for my kind of writing (travel writing ), time needs to be made when I can sit down in a room with everything else in order . I feel that when everything else is in place, there is space for inspiration to come. To overcome that white piece of paper, I need a distraction-free atmosphere. Q. 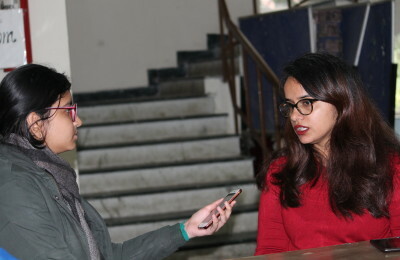 You undoubtedly have a great number of readers within Delhi University and among them quite a few budding writers as well. Any advice for them? I feel that for any writer, it is extremely important that they have good things to read. I always feel that is more helpful in the wrong run than the numerous writing courses that people sometimes take. I would say that it is important that one discovers and learns to refine their tastes. Mozart was an important influence on the early works of Beethoven. Personally speaking, I enjoy the works of Robert Burns and he has been a great influence in the shaping of my first book, In Xanadu: A Quest. On another note, I think gaining confidence in one’s own writing is very important. Most writers start off with writing for a student newspaper or a magazine. It is not too often that someone may produce a novel as their first sample of writing. Perhaps , one can start off with writing short profiles , long profiles, reports etc. before moving on to novels.